Does the Pope end up on a rope? Or will he manage to slip away...! A textbook Italian Wars French army, containing the mandatory Mikes Models Swiss Pike Kiel takes on three opponents in one day in the Southern League round held in Southampton. See all the usual stuff, with the added bonus this time of a new commander for the French Army being deployed and using his extensive linguistic skills to explain his success - or lack of it perhaps..? 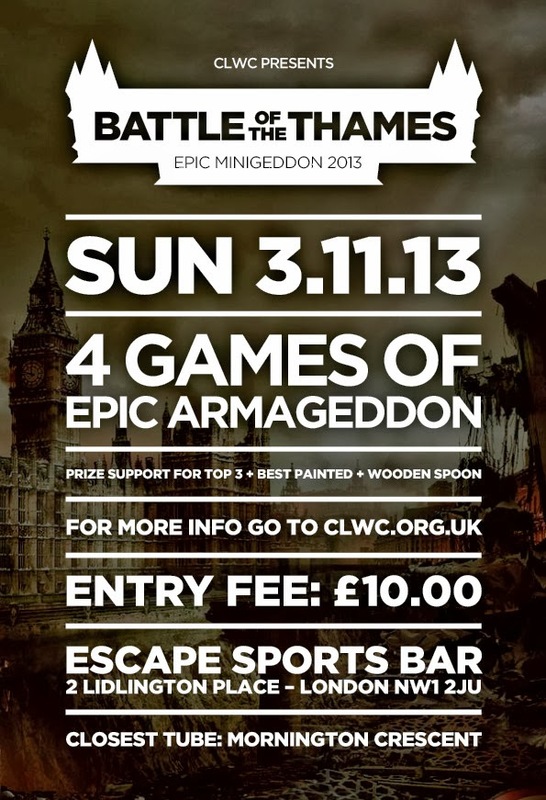 Central London Wargames Club is running London's first Epic Minigeddon tournament! Minigeddon is a fun and fast-paced supplement for GW's Epic Armageddon and great for newcomers and seasoned players alike, For more information and the official Epic UK sanctioned rule set please visit the Epic Armageddon London website. The tournament consists of 4 rounds of swiss-format, using 1000 points armies. Entry fee is £10 which helps the club to pay for the venue and terrain. 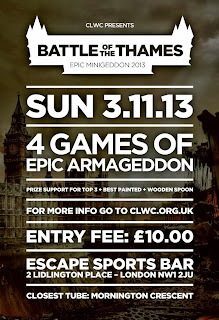 There will be trophies for the top 3 players, best painted army and also the infamous wooden spoon. Lists can be chosen freely from the latest NetEA Tournament Pack 2013-08-07, EpicUK lists overrule where applicable though. We're looking forward seeing you at the table!